Manhattanite Cecily Sinclair is the host of cooking show Serving Romance where she creates gourmet French cuisine. When new CEO Devlin Hayes takes over CuisineTV with plans to rebrand the network, Cecily finds out that her show is going to change drastically, including the addition of Cecily’s former nightmare of a boss, Italian chef Dante Marchetti. Despite constantly being at odds, viewers love their chemistry together, much to Cecily's dismay. But Cecily is determined to maintain her reputation and the integrity of her show, which means getting a step ahead of Dante and Devlin with her own schemes. As she tries to figure out if she's really meant for TV or if she should take a new path, she finds herself embroiled in romantic drama with both men who drive her crazy. 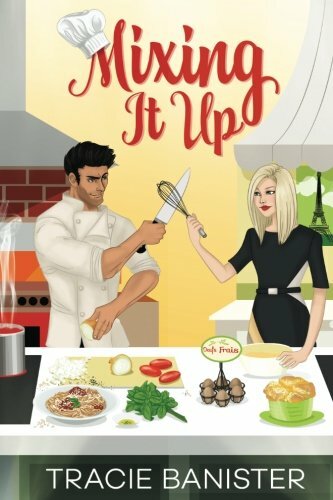 Mixing It Up is a fast-paced, well-written novel that will have readers guessing until the very end. Cecily is determined to control all aspects of her life. The more curveballs that are thrown her way, the more headstrong she becomes. She is definitely one of the strongest Chick Lit heroines, but her stubbornness gets her into some trouble. So, it’s a good thing Cecily has caring friends to help her relax a bit. The dynamic between Cecily and her best friend/cousin, Dina, is fun to read because they are so different, but they balance each other out so well at all the right times. For most of the book, it’s unclear who Cecily will end up with romantically. She has chemistry with Dante and Devlin, which makes things interesting. Readers will likely root for both men at different times during the book, as well as be frustrated by both. With Cecily’s love life unclear, there’s enough work drama and family drama to keep the story moving along. The best aspect of Mixing It Up is the author’s writing style, which is so natural and effortless, making it an easy yet compelling read. Cecily’s passion for food jumps off the pages thanks to the author’s exquisitely detailed culinary descriptions. Foodies and Chick Lit fans are sure to enjoy this entertaining read that excels in gastronomy, humor, and romance. Highly recommended!